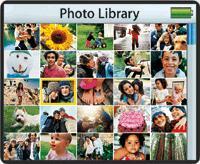 From Apple's support library: iTunes and iPod Photo: Frequently asked questions about Photo Sync. iPod Photo: As a Digital Wallet, Does it Miss the Mark? 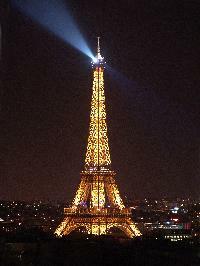 I'm back, but I'd rather be in Paris. There's nothing like a computer-free vacation to help realign your perspectives and reboot your brain. If you work in the computer industry and you go on vacation with a computer, you aren't going on vacation. A real vacation means not checking email, not listening to the blather of blogs, not pointing and clicking -- not paying attention to the things that normally consume you. Just before I left, I wrote about my digital wallet plans and I lamented that the two wallets I planned to take for storing photos -- Archos' Gmini 400 and SmartDisk's FlashTrax -- each had some rough edges. "This is a market that needs Apple's touch," I opined. Today, Apple touched it, introducing iPod Photo, the first iPod with a color screen and features for storing and presenting photos. The color screen looks gorgeous and the photo-syncing features appear impressive, but at first glance, I see two shortcomings that would have prevented me from relying exclusively on iPod Photo during my vacation. Belkin's readers transfer data from a memory card at two speeds: sluggish (the Digital Camera Link for iPod) and glacial (the Media Reader for iPod). They're just too slow. What's more, they require their own batteries, and you can't charge the iPod while using them, since they plug into the iPod's dock connector. And if I've already paid $499 or $599 for a digital wallet, it hurts to spend another $80 to $100 for the device that makes it useful in the field. No support for raw-format images. A growing number of advanced amateurs are shooting images in raw format instead of JPEG, and now that Photoshop Elements supports raw, that number is going to increase. But according to Apple's Web site, iPod Photo doesn't sync raw files. Now, to its credit, the iPod Photo appears to do some things far better than the competition. I love the fact that its slideshows provide image transitions and background music, and that its dock provides an S-video connector for sharp TV playback. Other digital wallets I've tested can't perform these tricks. I'll be getting an iPod Photo soon, and will be writing up my experiences with it here as well as in my monthly Macworld column. But my first impressions? It's great to see the iPod evolve to encompass photo storage, and it's great to see those typical Apple touches about which competitors seem clueless. But lack of a Compact Flash memory slot is disappointing, and questionable support for raw files should raise eyebrows among serious amateur and professional photographers. Want to sync up photos from your Mac or PC and then show them on TV at a family get-together? The iPod Photo is for you. Want a device that lets you offload photos on the road so you don't have to buy a case of memory cards or take along a laptop? Consider the Archos Gmini 400. It lacks the auto-syncing simplicity that iPod Photo provides, and its interface is clumsy at times. But it's tiny, sports a memory-card slot and a USB 2.0 interface, and costs $399. Now where's that box of Belgian chocolates I brought home? I'm off to Europe for a couple of weeks of vacation sans computers. Unless, of course, you count two digital cameras, two digital wallets, and an iPod. 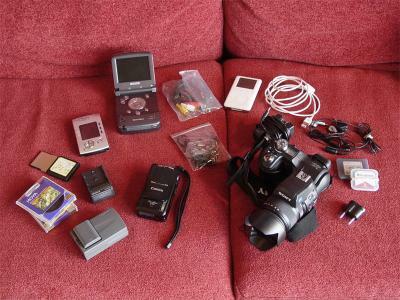 Here's a look at what I'll be cramming into my camera bag. Frequent visitors to this site will recall that I've been researching a variety of digital wallets for storing the photos that my wife and I will be shooting. The winners? The Archos Gmini 400 and a Smartdisk FlashTrax. I'll be taking both so I have redundant backup for our photos. And having learned an important lesson from a friend, I'll be carrying and storing them separately, so if one gets stolen or lost, I won't lose everything. Although my iPod will be along for music duties, I won't be using Belkin's Digital Camera Link. It's a bit too slow, although it's much faster than Belkin's Media Reader for iPod. After working with these devices for a couple of weeks, I'm convinced that gizmos like these are the future -- we need portable devices that enable us to store and play back not only music, but also photos and, to a lesser degree, video. I'm also convinced that there's room for improvement -- both devices have shortcomings or annoyances that I'll write about upon my return. This is a market that needs Apple's touch. I leave you with a few links for your surfing enjoyment. rawformat.com. A recent addition to the Avondale Media network, rawformat is the place to get the skinny on the new Digital Negative photo format and on the advantages of shooting in -- yes, raw format. Web Design World, Boston. I'm the Conference Chair of this three-day event, which takes place December 6, 7, and 8. Some of the Web world's most brilliant designers and teachers will be there -- join us! The Macintosh iLife '04. Yup, it's my baby, and although I'm biased, I think you should have it. Nearly 300 gorgeous, full-color pages on all five iLife programs, and a two-hour companion instructional DVD -- for $20.99 on Amazon. There isn't another book like it. Check out the PDF and video excerpts, and see why one reviewer called it "the best computer book ever, bar none." And with that shameless bit of me-commerce, I'm outta here. Be good to each other, don't burn the house down, and don't anthropomorphize your Macs. They hate that. Richard Avedon, known for his stark, probing black and white portrait photography, has died at age 81. It was my father who taught me the physics of photography. When I was a boy he explained to me the power of light in the making of a photograph. He held a magnifying glass between the sun and a leaf and set the leaf on fire. The next day, as an experiment, I taped a negative of my sister onto my skin and spent the day at Atlantic Beach. That night, when I peeled the negative off, there was my sister, sunburned onto my shoulder. I knew from the beginning that being a photographer and playing with light means playing with fire. Neither the photographer nor the subject gets out of it unsinged.